PLEASE READ FULL DESCRIPTION AS THIS ITEM IS SOLD AS IS!!!!!! 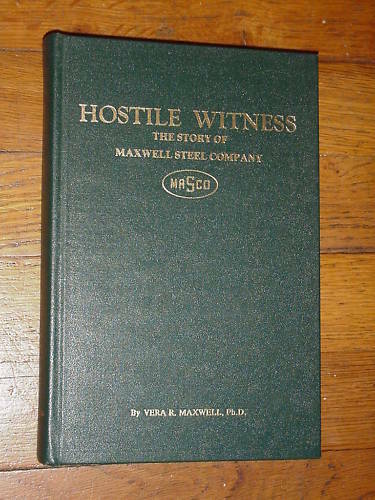 Hostile Witness, The Story of Maxwell Steel Company, MASCO, by Dr. Vera R. Maxwell, PHd. Possible 1st edition Historical book covering the years 1933-1959 as written by the widow of the founder. Contains many black/white photos, copies of newspaper clippings from earlier years, 183 pages total. Very thorough with many details, dates, employees, management, changes to the company,etc. It is a dark green hardcover book with shiny gold lettering. Inside front cover is a unauthenticated note to Joe Towater, signed Vera R. Maxwell, March 1981. Book is in LIKE NEW condition, (EXCEPT FOR A VERY LIGHT THUMBPRINT-SIZED DISCOLORATION ON THE ENDPAGE.) There are no pen marks (other than the above mentioned notation, signature), no tears, no yellowing, etc. No wear to cover, no musty smell. A rare collectible detailing this steel company during the Depression. Published by Dr. Vera R. Maxwell, Fort Worth , Don Cowen Company, Fort Worth TX. Printed in the United States of America Shipping/handling includes REQUIRED DELIVERY CONFIRMATION AND INSURANCE (inside the contigious United States) Alaska, Hawaii, Puerto Rico, etc may be higher Please note: IN the rare event your item arrives damaged, please retain all shipping materials (envelope, bubble wrap, box) as you will need to take them, along with the item, to the United States Post Office to make an insurance claim. Also, email me for additional insurance info (green slip) as you may need that info also, should you have to file a claim. (COMMUNICATION IS THE KEY, EMAIL IF YOU NEED TO ASK) NO PERSONAL, BUSINESS, OR CASHIERS CHECKS ACCEPTED PAYMENTS MUST BE by PAYPAL (confirmed addresses only) or ACCEPTED CREDIT CARD thru PAYPAL SHIPPING TO THE UNITED STATES ONLY NO PICKUPS THIS ITEM SOLD AS IS!!! !